Wagon Creek flowing toward Mount Shasta. 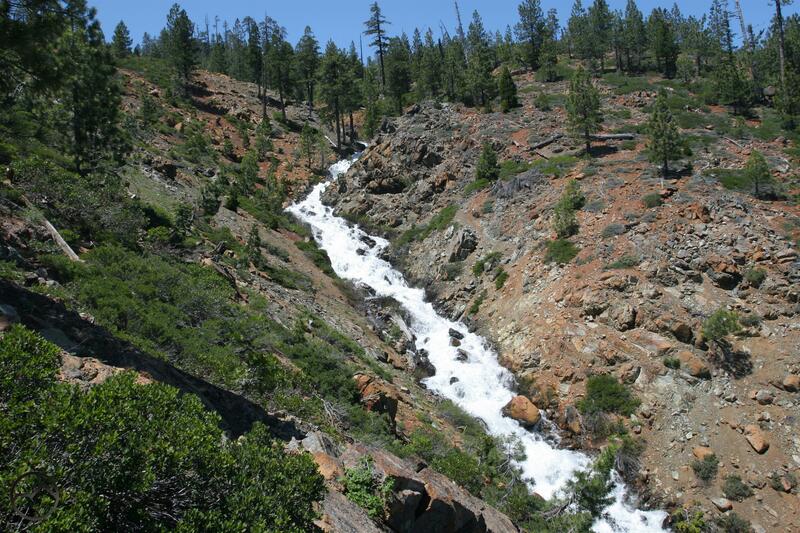 Many of the creeks and rivers around Mount Shasta are well known. The McCloud and Sacramento Rivers receive great renown and many of the creeks, like Mud Creek, Squaw Valley Creek and Castle Creek are lauded for their beauty. They are all wild, wonderful courses of water in beautiful mountain landscapes. However, one exceptional creek goes unappreciated. Wagon Creek is familiar to many, winding along Old Stage Road west of Mount Shasta City. 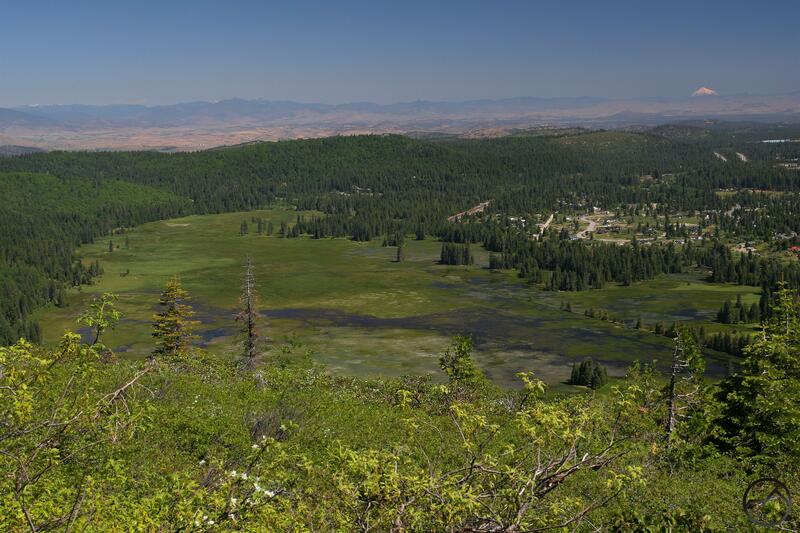 It flows past houses and through forests before eventually being stilled at Lake Siskiyou. It has also given its name to the landmark Wagon Creek Bridge, which crosses over the eponymously named arm of Lake Siskiyou. While the bridge has raised the creek’s profile a little, it gives no indication of how marvelous and scenic the upper section of Wagon Creek is. Boasting beautiful waterfalls and powerful cascades surging through rocky chutes, the early sections of its journey are almost more vertical than horizontal, falling thousands of feet down the flanks of Mount Eddy in a tumult of whitewater. Yet, aside from brief glimpses of the cascades from far below, upper Wagon Creek remains seldom seen, appreciated by the few who make the trip to enjoy its delights. A section of the Wagon Creek cascades. Wagon Creek begins high on the slopes of Mount Eddy, in large basin often referred to as Eddy Bowl (fear not, Eddy Bowl will get just consideration in a future post!). Though Mount Eddy is not volcanic, the shape of the bowl can at times appear like a crater, remnants of some past eruption. While this is not the case, it is broad, with tall walls closing it in. The bowl is home to several small ponds and patches of meadow, all of which constitute the headwaters of Wagon Creek. The disparate streams emerging from the ponds and meadows are all collected at the base of the bowl, where Wagon Creek is born as a large waterway. It then enters a narrow gulch and begins its swift descent down the lower slopes of Mount Eddy. Losing over 2,000 feet in less than 2 miles, this section of its journey is an exciting and beautiful scene. Frothing water leaps and pours through the red, rocky chasm, plunging from one cascade to the next in seemingly endless sequence of cataracts. When the creek is swollen with snow melt from the spring thaw, this roiling strand of water is visible from far below at the bottom of the valley. The Abrams Lake Exit on I-5 has a particularly good view, though the white water seems all but in accessible from below. What remains hidden from view, however, are a pair of beautiful waterfalls. 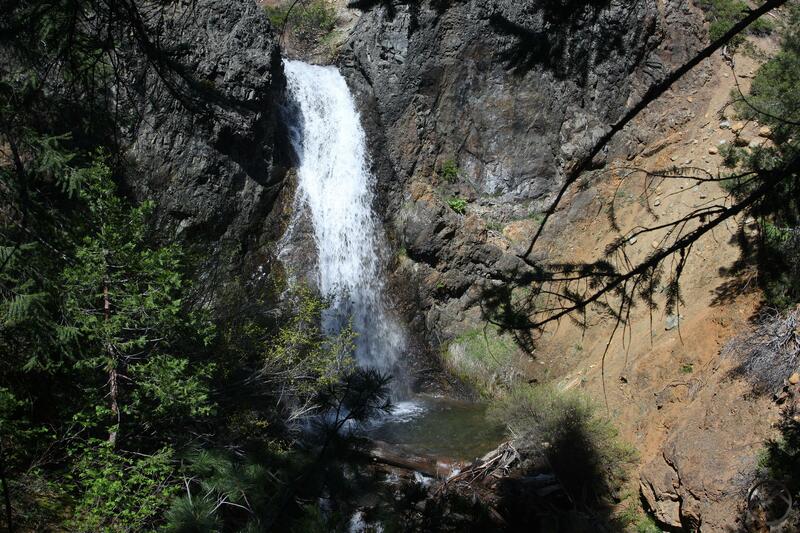 Wagon Creek Falls is among the least known waterfalls in the Mount Shasta area. 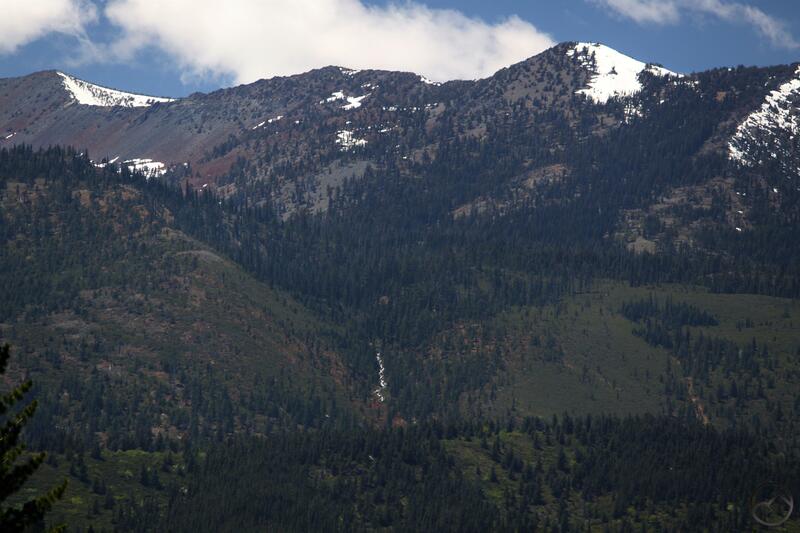 It is part of a special group of beautiful but utterly unappreciated waterfalls that includes some gems on Mount Shasta, a few specimens deep in the Castle Crags and a couple of surprising falls on the South Fork of Castle Creek among a few others. Under normal circumstances, each of these would be the destination of a popular trail, but now they are shrouded in anonymity and left to their own, wild devices. What is missed with Wagon Creek Falls is a plunge with classic waterfall lines. Pouring through a notch in a serpentine cliff, Wagon Creek Falls is a tall, rectangular cataract. Its lines are reminiscent of Vernal Falls in Yosemite, albeit much smaller. It is about 35-40 feet high and though not a world-beater when it comes to size, it remains a very beautiful falls nonetheless. As a bonus, there is another, shorter and less classic waterfall just upstream. I refer to it as Upper Wagon Creek Falls. The pair makes a great 1-2 punch for those who favor falling water. Wagon Creek flows through Mills Meadow. When the Wagon Creek completes its tumble down Mount Eddy it is instantly quieted as it flows through sublime Mills Meadow, easily the prettiest meadow in the region, save those small patches that cling to the barren slopes of Mount Shasta. The meadow is broad and beautiful, ringed by forests of aspen, pine, fir, cedar and oak. In the fall, it has some of the best color around. The meadow retains an immense amount of water, acting like a massive sponge. For this reason, Wagon Creek’s flow is fairly substantial all year, regardless of how much rain or snow has fallen. The contrast from the raging cascades and waterfalls to the slow moving meander across Mills Meadow is as striking as it is beautiful. It gives Wagon Creek a varied personality, all of which worth beholding. Interestingly, the creek marks the northern limit of the Sacramento River watershed. The headwaters of the river proper are actually southwest of Wagon Creek. Unfortunately, the upper section of Wagon Creek is difficult to reach. There is no doubt that this has, in part, contributed to its anonymity, and to the anonymity of Wagon Creek Falls. The cascades and the waterfalls can be approached from a couple of directions, both of which are long and in some cases, gruelingly steep journeys. The shorter (but steeper!) route is also beset by private land, which further restricts access. However, for those how make the trek, they are rewarded with one of the most wild and beautiful and powerful creeks in the region. A view of the Wagon Creek cascades from the Abrams Lake exit on I-5. A section of the surging Wagon Creek cascades. Lower section of the cascades, just before the upper falls. Mount Shasta, visible from Wagon Creek. 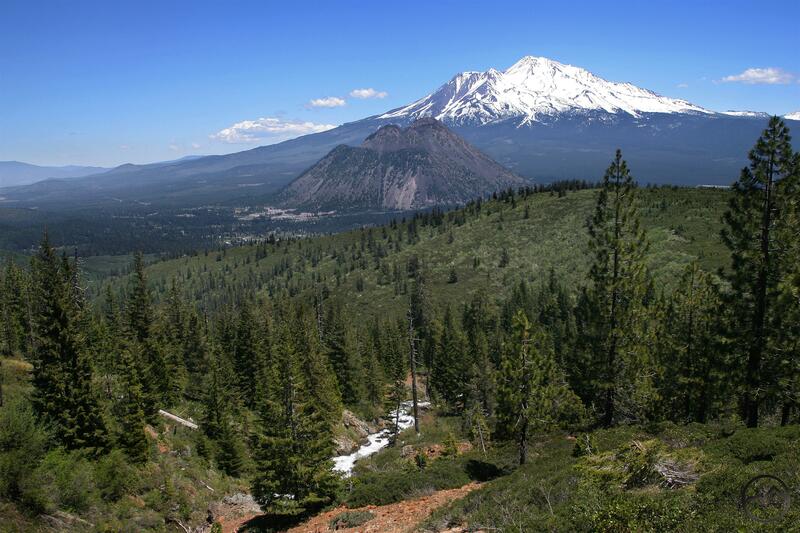 Mount Shasta and Black Butte, from a route to Wagon Creek. Thank you! It is a great, if obscure, spot. FYI just bought the last copy of your new book at the Redding Barnes and Noble. Awesome! Thanks for picking it up. i hope you enjoy using it. I really appreciate the update too! Could you please let me know the best way to get to these falls? A couple of friends and I have been planning to get up there for years. We want this year to be the year. It would be great if you could chat with me about it. I live in your neighborhood……..😊 I have the three-story fort and giant swing set on the way to the meadow. By the way, I love your website. I share it with everyone and I keep it on my phone always. It’s the best!! Hi Chari. Shoot me an email (on the contact page). I like to keep details for these kinds of places off the website. I can help you out from there.